My City Bikes offers mobile apps tailored for entry-level riders in 130 U.S. communities. SAN JUAN CAPISTRANO, Calif. (BRAIN) — Interbike is working with My City Bikes, the maker of free mobile apps that provide resources for beginner cyclists in specific communities, including 130 so far in the U.S.
"My City Bikes' national campaign aligns perfectly with The Manifesto for Change — doing what we can to help grow the industry (retail and supply) and to ultimately help get more people on bikes," said Pat Hus, the vice president of Interbike. My City Bikes will have "a significant presence" at this fall's Interbike show, including being the presenting sponsor of the show's consumer day, to be held Friday, Sept. 18. The organization behind the My City Bikes apps is described as a "corporate social responsibility model public health initiative." The apps are available for Apple and Android mobile operating systems. Each community's app includes local ride information, links to advocacy groups and other resources, information on bike maintenance and more. Local bike shops can have a presence in their region's app by sponsoring it. (Related: A directory of the apps available so far). For example, Cycle Loft in Burlington, Mass. is one of the shops listed in the Boston app. Cycle Loft owner Jeff Palter said he paid the app's developers $1,500 for a "lifetime" sponsorship of his region's app. "We got on board early with My City Bikes and have seen a steady increase in new riders coming through our doors via the app," Palter said. "If the app doesn't exist in your community yet, you just have to reach out to them and start the process. It's really that simple." Palter said his shop provided the app's developers with information about area riding resources, including trails, clubs, and advocacy groups, as well as information about recommended necessities for local cyclists, such as pumps and inner tubes. 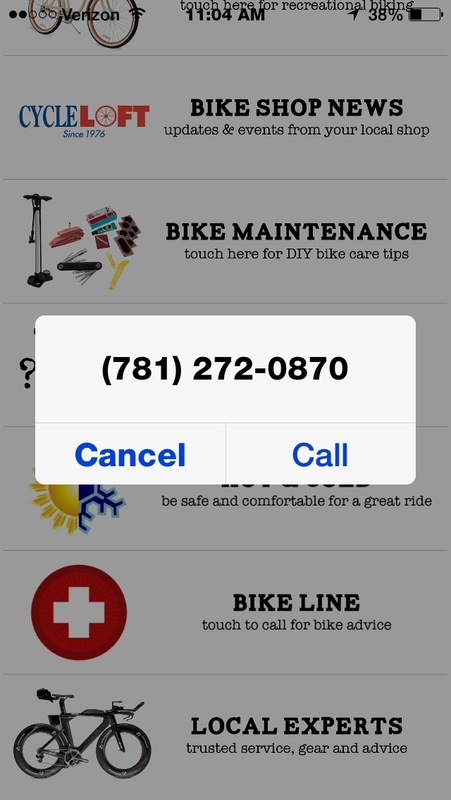 Besides a listing under the "Local Experts" tab in the app, a "Bike Line" link brings up Cycle Loft's phone number for a one-touch dial. Palter said the app fits his shop's goal of developing new bike riders. "I like that it is geared toward not just the Lycra bike riders, but the new riders and the people who just want to ride bikes without being too serious about it." In a press release announcing Interbike's partnership with My City Bikes, Chris Prager, the board chair of My City Bikes, said, "Our mission is to create beginner biking resources that empower individuals to improve their health by simply pedaling a bike ... We believe this partnership will help accelerate our mission by showcasing the power of our basic but essential mobile resources to the entire audience at the largest gathering of the bike industry in North America." The "Bike Line" link brings up Cycle Loft's phone number.